Pierre-François Ouellette art contemporain is pleased to present Therebefore and Hereafter, a solo exhibition of work by Montreal artist John Latour. An ongoing theme in Latour’s work is the idea of “the past”, and how our experience of it is mediated through objects, images and texts. More recently, the artist has looked to the history of spirit communications as a metaphor for dialoguing with the past. 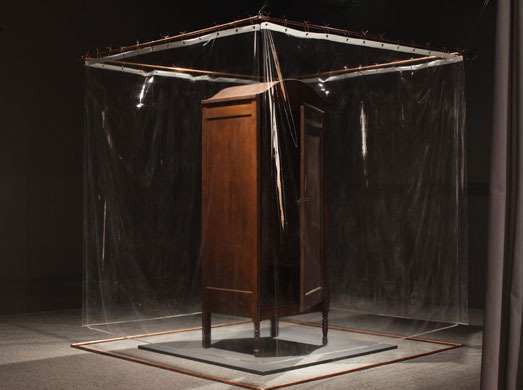 The focal point of Therebefore and Hereafter is the artist’s Psychic cabinet (2010) an interactive installation based on the tradition of spirit cabinets – enclosed spaces created from furniture and curtains that were used by mediums of the late 19th and early 20th centuries to focus their psychic powers before or during séances. The presentation of Psychic cabinet in downtown Toronto draws attention to the city’s long and sometimes complicated history with spirit communications. Toronto was the locus of at least three Spiritualist organizations at the turn of the 20th century (the Canadian Spiritualist Association, the Spiritualist National Union of Canada and the Toronto Spiritualist Association); although as Stan McMullin notes in his Anatomy of a Seance, mediums in Toronto (and elsewhere) at that time could be – and were prosecuted through the Canadian Criminal Code under the Witchcraft section of the Vagrancy Act. Latour also presents, in Therebefore and Hereafter, a selection of modified, vintage found photographs from a series he began in 2007. Unidentified persons posing in old snapshots are erased through flecks of white paint applied to the surface of the photographs. Their disappearance suggests the eventual fading of all subjects over time. In some of his most recent works from this series, currently on display at Centre Space, the artist has painted text on top of the photographs to create new meanings. On the occasion of the opening, Latour’s newest artist’s book will be launched. Re fictions (2018) represents a partial erasure (and re-telling) of his earlier collaborative publication Rétrofictions (2012) – where six authors (Jennifer Allen, Marina Endicott, Cynthia Imogen Hammond, Lea Nakonechny, Eduardo Ralickas and Jean-Éric Riopel) were invited to write short stories based on modified found photographs from his art practice. Stan MCMULLIN, Anatomy of a Seance: A History of Spirit Communication in Central Canada, Montréal, McGill-Queen’s University Press, 2004, pp. 17-18. Pierre-François Ouellette art contemporain and artist thank SODEC for its support. John Latour has a BFA in Studio Art (University of Ottawa), a MLIS (McGill University) and a MA in Art History (Concordia University). Solo exhibitions of his work have been held in Alberta, Ontario and Quebec, and he has participated in group exhibitions in Canada and abroad. He has received artist grants from the Canada Council for the Arts, the Conseils des arts et des lettres du Québec and the Ontario Arts Council. His work is found in numerous private collections as well as the Hallmark Fine Art Collection (Kansas City), the Fine Art Collection of the City of Ottawa, and Le Méridien Versailles (Montreal).